A tendon is a band of tissue that connects muscle to bone. The main function of the tendons is to stabilize the foot and the ankles and to protect them from strains.The two pereoneal tendons in the foot run side by side behind the outer ankle of the foot. One tendon attaches to the outer part of the mid foot whilst the other runs under the foot and attaches near the inside of the arch. Peroneal tendonitis is an inflammation of the peroneal tendons, which causes the swelling of the outer ankle. Those who enjoy running are bound to deal with this issue at least once in their lifetime. It does you a world of good to be informed regarding the challenges that will crop up when you are dealing with peroneal tendonitis running to ensure you apply the correct interventions in what could spoil a favorite pastime of yours. There are a number of interventions that can be applied to fasten recovery of peroneal tendonitis, running then is possible! RICE: This is an acronym of the first option. Unpacked the “R” stands for rest, which basically means giving a time out to the ankle. The “I” stands for ice which keeps the swelling down. The “C” stands for compression of the ankle that ensures that blood flow is kept constant thus prevents swelling. 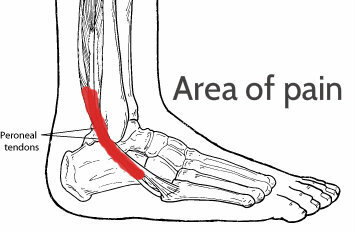 The “E” stands for elevation, which aides in taking off pressure from the foot. During recovery, it is best to wear supportive cushioned footwear any time you’re on your feet. Orthotic insoles may be recommended if you have a problem with either oversupination or overpronation, or apply a tapping procedure to help reduce movement and give the tendon time to rest. Other interventions that can be applied include applying sports massage directly to the peroneal muscles thus aiding in reducing tension. Applying friction massage techniques on the tendons themselves increases the flow of blood to the tendons and breaks down excessive scar tissue in the tendons. Isometric exercises: This is a static contraction. The ankle is set against a stationery object, for instance the leg of a chair, and one simply relaxes and contracts the muscle. Concentric strengthening: This is achieved using ankle weights or rehab bands. The idea here is to develop strength on the ankle. Eccentricstrengthening: This is the final stage and will involve a partner who pronates (inverts) the foot whilst you subtly resist the force applied. Recovery time varies from individual to individual. It goes without saying that those who require surgery will need substantially more time to recover and might even be subjected to attend physical therapy. Peroneal tendonitis running is possible once you are pain free and have identified the root cause. Start with a short jog (say 10 minutes) and then rest for two days. Repeat this twice, and if symptoms do not recur, build up your running time by an additional 5 minutes running twice or thrice a week. Continue in this fashion until you can get back to your normal routine.